analysis of the queries being executed in the database. The EXPLAIN facility provides an "English" translation of the plan the SQL Optimizer develops to service a request. Sample Syntax for Explain is. High Confidence - Statistics available on an Index or Column. Low Confidence - Random sampling of INDEX, or Statistics available butAND/OR condition exists. No Confidence - Random sampling based on AMP row count. No statistics are collected. Understanding the EXPLAIN Terminology you should know the Keywords. Locking Pseudo Table Serial lock on a symbolic table. Every table has one. Used to prevent deadlocks situations between users. Where unknown comparison will be ignored Indicates that NULL values will not compare to a TRUE or FALSE. Seen in a subquery using NOT IN or NOT = ALL because no rows will be returned on ignored comparison. Nested join The fastest join possible. It uses a UPI to retrieve a single row after using a UPI or a USI in the WHERE to reduce the join to a single row. ROWID join A very fast join. It uses the ROWID of a UPI to retrieve a single row after using a UPI or a USI in the WHERE to reduce the join to a single row. 1. First, we lock a distinct SQL_CLASS. "pseudo table" for read on a RowHash to prevent global deadlock for SQL_CLASS.Emp_Table. 2. Next, we lock SQL_CLASS.Emp_Table for read. 3. We do an all-AMPs RETRIEVE step from SQL_CLASS.Emp_Table by way of an all-rows scan with no residual conditions into Spool 1 (group_amps), which is built locally on the AMPs. The size of Spool 1 is estimated with low confidence to be 6 rows (342 bytes). The estimated time for this step is 0.03 seconds. 4. Finally, we send out an END TRANSACTION step to all AMPs involved in processing the request. -> The contents of Spool 1 are sent back to the user as the result of statement 1. The total estimated time is 0.03 seconds. 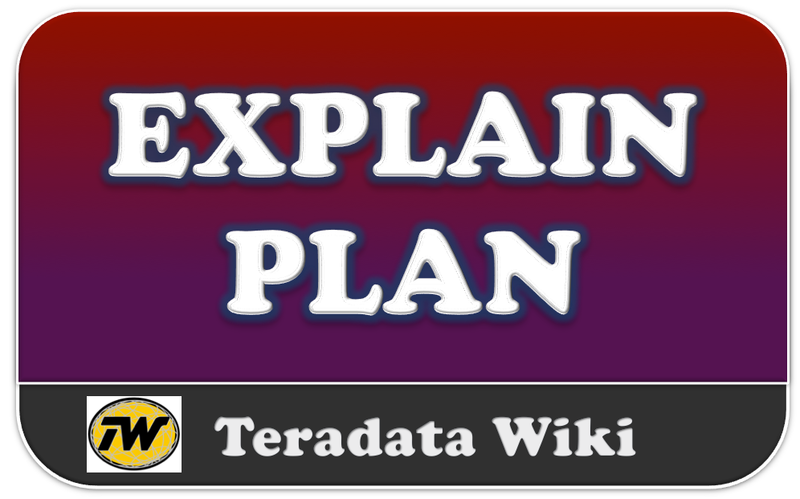 If you see all-AMPs RETRIEVE by way of an all-rows scan in your plan, that means teradata is doing a Full Table Scan. So it is reading every row in the table. 1. First, we do a single-AMP RETRIEVE step from SQL_CLASS.Emp_Table by way of the unique primary index "SQL_CLASS.Emp_Table.Emp_No = 123000" with no residual conditions. The estimated time for this step is 0.01 seconds. -> The row is sent directly back to the user as the result of statement 1. The total estimated time is 0.01 seconds. In the Emp_table, Emp_no is the Unique Primary Index. So USI used in where clause. So it gives Single-AMP retrieve by way of the Unique Primary Index. This is the fastest query! 1. First, we do a single-AMP RETRIEVE step from SQL_CLASS.Sales_Table by way of the primary index "SQL_CLASS.Sales_Table.Product_ID = 1000" with no residual conditions into Spool 1 (one-amp), which is built locally on that AMP. The size of Spool 1 is estimated with low confidence to be 2 rows (66 bytes). The estimated time for this step is 0.02 seconds. -> The contents of Spool 1 are sent back to the user as the result of statement 1. The total estimated time is 0.02 seconds. 1. First, we do a two-AMP RETRIEVE step from SQL_CLASS.Emp_Table by way of unique index # 12 "SQL_CLASS.Emp_Table.Last_name = 'tendulkar ' , SQL_CLASS.Emp_Table.First_name = 'Sachin'" with no residual conditions. The estimated time for this step is 0.01 seconds. ->The row is sent directly back to the user as the result of statement 1. The total estimated time is 0.01 seconds. 4. We do an all-AMPs RETRIEVE step from SQL_CLASS.Emp by way of an all-rows scan with a condition of ("NOT (SQL_CLASS.Emp.Dept_No IS NULL)") into Spool 2 (all_amps), which is redistributed by the hash code of (SQL_CLASS.Emp.Dept_No) to all AMPs. Then we do a SORT to order Spool 2 by row hash. The size of Spool 2 is estimated with low confidence to be 6 rows (294 bytes). The estimated time for this step is 0.01 seconds. 5 We do an all-AMPs JOIN step from SQL_CLASS.Dept by way of a RowHash match scan, which is joined to Spool 2 (Last Use) by way of a RowHash match scan. SQL_CLASS.Dept and Spool 2 are joined using a merge join, with a join condition of ("Dept_No = SQL_CLASS.Dept.Dept_No"). Hope you understood about EXPLAIN. I think the 2 amp retrieve specified for UPI is USI case, right ?? Also, we can include the PPI case for explains as well. The explain clearly states the number of partitions being leveraged. It was Type and corrected now, Thanks :) Will Include PPI aswell.. Very neat and good. Thanks a lot. If you can add UNION, Cartesian Product Join, Exclusion Join and PPI to PPI join.. it would be great..